Without a plan, the process of creating a wine collection can be overwhelming. A firm understanding of your preferences and consumption habits will save money and time, and result in a cellar that is perfect for you. California Chardonnay: A free chart offers an alphabetical list of all California Chardonnay wines reviewed for the tasting report in this issue. California Zinfandel: A free chart offers an alphabetical list of all California Zinfandel wines reviewed for the tasting report in this issue. Australia: A free chart offers an alphabetical list of all Australian wines reviewed for the tasting report in this issue. 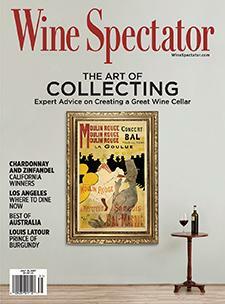 WineSpectator.com: Planning on investing in your wine collection this year? Keep on top of the latest auction news and market trends in our Collecting section, and sign up for our free twice-monthly Collecting e-mail newsletter to get great wine picks for the cellar and much more. FREE: California Chardonnay Alphabetical Listing - More than 520 wines were reviewed for this report. A free alphabetical list is available. WineSpectator.com members can access complete reviews for all the wines tasted using the online Wine Ratings Search. FREE: California Zinfandel Alphabetical Listing - More than 320 wines were reviewed for this report. A free alphabetical list is available. WineSpectator.com members can access complete reviews for all the wines tasted using the online Wine Ratings Search. FREE: Australia Alphabetical Listing - More than 745 wines were reviewed for this report. A free alphabetical list is available. WineSpectator.com members can access complete reviews for all the wines tasted using the online Wine Ratings Search. WineSpectator.com: Read more of Bruce Sanderson's 2015 Burgundy coverage, see his recent blog posts. How to Describe Chardonnay: Enjoying Chardonnay is easy. But how do you describe it? And what are some delicious food pairings? Kendall-Jackson's Randy Ullom reveals his tasting method. Zin on Film: These videos star some of the top names in California Zinfandel, including Ted Seghesio, Bedrock's Morgan Twain-Peterson, Carlisle's Mike Officer and more. FOURTH OF JULY PARTIES Bring some culinary fireworks to your festivities with a great new summer recipe and crowd-pleasing wines to pair with it. DESIGN INSPIRATION Looking for ideas for how to set up a wine cellar or create a dynamic space for cooking, dining and entertaining at home? Check out our series Private Cellars and Wine & Design, complete with photo galleries for inspiration. WINE SPECTATOR'S 11TH ANNUAL VIDEO CONTEST What's your wine story? Submit your video to Wine Spectator's 11th Annual Video Contest by Sept. 4 and you could win great prizes! Anyone 21 or older can enter, whether you're in the biz or just a wine lover. The winning video will be screened at the Wine Experience, and the winner will receive two full passes to the Wine Experience weekend. All finalists will win two passes to a Grand Tasting or Grand Tour evening, and all qualified entrants receive a one-year membership to WineSpectator.com. Pick a Topic Maybe you'll make a how-to film, an informative documentary, a music video, an animated short or a cooking demo. Shoot Use your iPhone, Android, GoPro, DSLR or video camera. Have Fun! Your video can be nerdy, funny, arty, real—or even surreal! Questions? Email us at video@mshanken.com. MASTER THE WINES OF AUSTRALIA Wine regions Down Under offer a diverse range of varietals, blends and wine styles. In three online classes and tastings, you'll get to know the key growing areas in Australia and New Zealand and their specialties. This and nine other Wine Spectator School courses are included with your WineSpectator.com membership. RATINGS ALERTS Early updates on the smartest buys and hottest collectibles from our editors' latest tastings—delivered right to your inbox! Advance: Peeks at picks from upcoming issues of Wine Spectator. Ratings Flash: Sign up and we'll let you know when we've added new reviews to our Wine Ratings search from your selected favorite wine regions.